Looking nothing like a camera or other traditional imaging technologies such as CCDs in optical telescopes or single receivers in radio telescopes, this new PAF design resembles a forest of miniature tree-like antennas evenly arranged on a meter-wide metal plate. When mounted on a single-dish radio telescope, specialized computers and signal processors are able to combine the signals among the antennas to create a virtual multi-pixel camera. This type of instrument is particularly useful in a number of important areas of astronomical research, including the study of hydrogen gas raining in on our galaxy and in searches for fast radio bursts. Over the years, other radio astronomy research facilities have developed phased array receiver designs. Most, however, have not achieved the efficiency necessary to compete with classical radio receiver designs, which process one signal from one spot on the sky at a time. The value of the new PAF is that it can form multiple views (or "beams on the sky," in radio astronomy terms) with the same efficiency as a classical receiver, which can enable faster scans of multiple astronomical targets. This newly developed system helps take PAF technology from a curious area of research to a highly efficient, multipurpose tool for exploring the universe. Commissioning observations with the National Science Foundation's Green Bank Telescope (GBT) using this new design show that this instrument met and exceeded all testing goals. It also achieved the lowest operating noise temperature – a normally vexing problem for clear views of the sky—of any phased array receiver to date. This milestone is critical to move the technology from an experimental design to a fully fledged observing instrument. 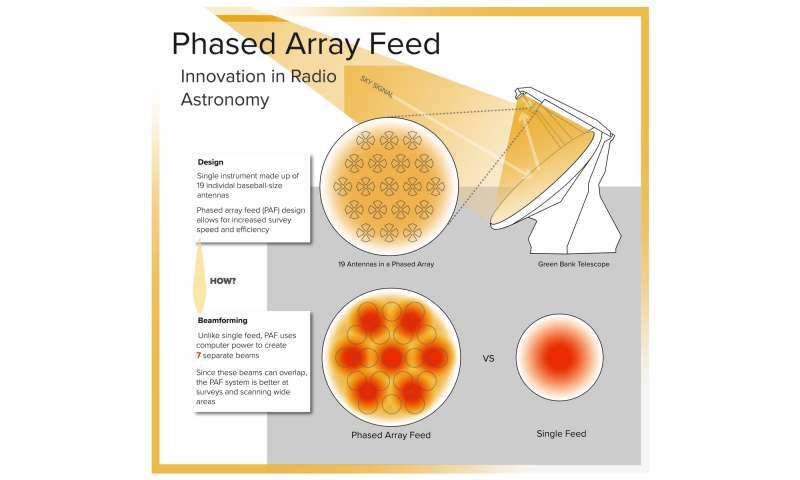 "When looking at all phased array receiver technologies currently operating or in development, our new design clearly raises the bar and gives the astronomy community a new, more rapid way of conducting large-scale surveys," said Anish Roshi, an astronomer-engineer with the National Radio Astronomy Observatory (NRAO) and a member of the design team. The new PAF was designed by a consortium of institutions: the NRAO's Central Development Laboratory, Green Bank Observatory, and Brigham Young University. "The collaborative work that went into designing, building, and ultimately verifying this remarkable system is truly astounding," said NRAO Director Tony Beasley. "It highlights the fact that new and emerging radio astronomy technology can have an immense impact on research." The new PAF design consists of 19 dipole antennas, radio receivers that resemble miniature umbrellas without a covering. A dipole, which simply means "two poles," is the most basic type of antenna. Its length determines the frequency—or wavelength of radio light—it is able to receive. In the PAF radio system, the strength of the signal can vary across the surface of the array. By calculating how the signal is received by each of the antennas, the system produces what is known as a "point-spread function" – essentially, a pattern of dots concentrated in one region. The PAF's computer and signal processors can calculate up to seven point-spread functions at a time, enabling the receiver to synthesize seven individual beams on the sky. The new design also allows these regions to overlap, creating a more comprehensive view of the region of space being surveyed. 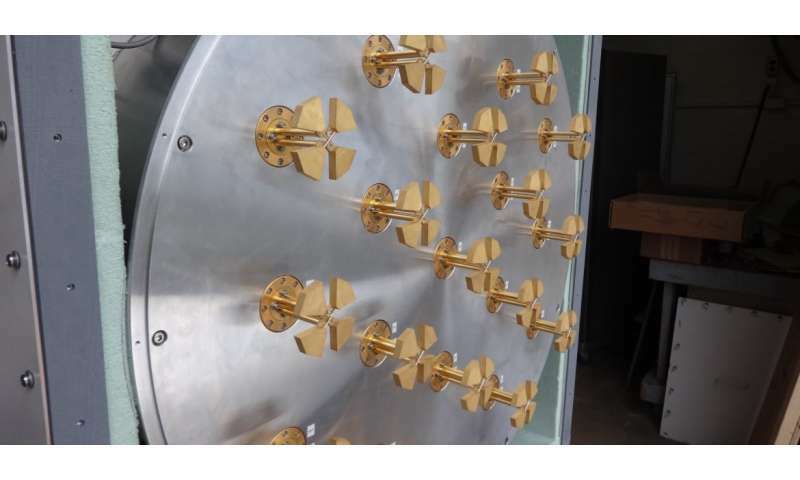 "This project brings together in one instrument a state-of-the-art, low-noise receiver design, next generation multi-channel digital radio technology, and advanced phased array modeling and beamforming," said Bill Shillue, PAF group lead at the NRAO's Central Development Laboratory.